DH: Hi, and thanks for inviting me. I’m a Kiwi (New Zealander) based in Wellington. I’m married with two children, and divide my time between working in financial services and writing. I have a degree in Classical Studies and History. I began my writing career doing YA novels. My first one, The Bone Tiki, was published in 2009 by HarperCollins New Zealand. It was lucky enough to win the ‘Best First Book’ award at New Zealand’s top children’s book award ceremony (The NZ Post Children’s Book Awards), which gave me some ‘cred’ as a writer here. I’ve subsequently had seven more YA novels published, both here in NZ and also in India, where I recently dwelt for four years. Both series are very "indigenous" - there's very tied to the country they were written in. When I’m not working or writing I love football (proper round-ball 11-a-side 'soccer', not the Rugby code New Zealand is more famous for), travel, music, and hanging out with family and friends. I’ve lived in the UK and India, and have visited many places in Europe, as well as a few spots in the USA, Russia, Asia and Oceania. Q: It’s a curious thing that I’ve noted. Both your previous series have been quartets and this one is also following a similar pattern. What’s your fascination with the number four and conversely you seem to be bucking the fantasy trends for a trilogy, your thoughts? DH: Four is the new Three! No, actually, that is just a ‘moment in time’/circumstantial thing: My New Zealand-based Aotearoa series will eventually be six books. My Indian series The Return of Ravana is indeed 4 books: I found when I was planning it that it fell into four broad parts that corresponded with the phases in the Ramayana epic upon which it is based. Moontide was for a long time going to be a trilogy but when I was finalizing its planning, it became clear that there was too much going on for a trilogy unless each book was biblical in length. Q: With both your series, the YA as well the epic fantasy one, there is a strong preponderance to Indian culture and mythology. As an Indian, it gladdens me to see a writer tap into the vast mosaic of our culture and use it to enhance fantasy. How did this come to be and what led you to fashion these stories in that way? DH: In 2007, while I was still waiting to hear whether The Bone Tiki would be accepted for publication, my soon-to-be-wife Kerry was offered a 4-year role in New Delhi, India. It seemed like a big adventure, so we decided to do it. It turned out to be a fantastic experience. Indian culture and history was totally new to me, and it was also my first experience of living in a non-Western civilization and a non-“first-world” country, all of which was an eye-opener. India is so vivid and colorful and dynamic that no-one could live there and not be affected. I found it totally inspiring, and being there as a “trailing spouse” I had the time to explore, and to write. We made many friends, have visited again since returning to New Zealand, and we both still miss it. Q: Many writers have a muse, who directs their writing, and others do not seem to be affected the same way. Which group do you fall into? What is your main motivation and source of inspiration? DH: I am primarily inspired by folklore and history, and especially the way they can intersect. Both my Aotearoa and Ravana series juxtapose the modern world with history and mythology. I enjoy bringing things from our past and our imaginations to life, especially in a setting where they don’t quite belong, and watching the chaos unfold. A typical David Hair YA story has historical people and mythic beings colliding with modern characters. In my Aotearoa series I do this by use of a kind of parallel-world/after-life; in the Ravana series I use reincarnation and past-life memories. I also find travel very inspiring, and have been lucky enough to see many places around the world. New Zealanders are great travelers, and getting out into the world is part of our make-up. It’s energizing, eye-opening, and always challenges your pre-conceptions in a good way. I love it! DH: Spoiler Alert! First up: there are a couple of hints (see especially the Chapter Heading for Chapter One of Mage’s Blood) that the Western and Eastern continents used to be linked. Without giving away too much, this is important not just in explaining the similarities, but in other ways that are picked up on later in the series. Secondly, my take on humanity (and I say this having some anthropology papers in my degree) is that for all the diversity of human culture, certain characteristics are fairly consistent and universal in large civilisations, including the development of a military/noble class, the (at least initial) centrality of religion, the dominance of males, the institution of marriage, economic inequality, etcetera. So I would posit that if you seeded several continents with humans, then kept them separate for centuries, they would develop in broadly the same way on these ‘big picture’ matters, though the details would be massively different, and the pace of development would vary considerably according to the natural resources and characteristics of the geography. So using your South/Central American examples, there were geo-political factors that slowed their technological development relative to European nations (Jared Diamond’s Guns, Germs & Steel does a fantastic job at explaining this), leading to the classic encounter of stone-axe wielding Incas with musket-toting Spaniards. But those Central/South American societies themselves were still broadly male-dominated, religion-dominated, warlike hierarchic societies not all that dissimilar to cultures of other eras in other places. Thirdly, in my book, by the time of Mage's Blood, windship travel and the Bridge have been around for many generations (more than 100 years), so there has been a certain homogenizing effect due to the spread of ideas, culture, and of course the pervasive dominance of the Rondian magi and legions. Q: In the world of the series the West gets the Gnosis and goes East to trade and then onto the Crusades? While that is not unlike what happened in our history living the magic aside, why not do it the other way here? DH: While Moontide isn’t meant as an allegory, I wanted it to broadly reflect our world and the conflicts we face. To do that, I needed the inhabitants of the Western continent to have a military/technology edge, and the arrogance that brings. Doing it the other way round was something I briefly tinkered with, but it felt wrong, especially as I was writing the series while living in India, with all the extremes of poverty and wealth around me. To reverse the roles might have been interesting, but it would have said less about our world. The sense of birthright and eternal superiority most mages in Moontide have was something that I felt resonated better if they were Westerners. The other factor of role-reversal was that it would have cast the Western people as the victims and the Eastern ones as aggressive overlords: I felt uncomfortable with that, given the state of the real world we all live in. It would have felt hypocritical. Q: Is there a Far East in Antiopia or nearby region that we do not yet see? DH: Spoiler Alert II! the maps in Mage’s Blood only represent about 1/3 of the planet. It is quite likely that there are other continents that the magi know nothing of (more people to exploit: Emperor Constant and his mum will be delighted!). You’ll notice that the map of Antiopia, the eastern continent, doesn’t depict a closed coastline. However, this series is firmly focused on the Third Crusade which is more than large enough in scope for me this time round. Q: Can you tell us more about the world that the Moontide Quartet is set in and some of the series’ major characters? What are curiosities (geographical, mystical, etc.) of this world? DH: Geographically, Urte, the world of Moontide, has one major defining characteristic that our world doesn’t have. The moon is much larger and closer, and therefore has a much more profound effect on the tides. This has led to the coastlines being dangerous places as the tides rise and fall hundreds of feet, and of course conventional sea-travel is more-or-less impossible. Even large lakes can be too hazardous to live near or traverse. As much of human travel and commerce on our world is water-based, you can imagine that this profoundly alters the nature of the world: it is much more insular than our own, much more regional and inward-looking. There is also a little-known and seldom glimpsed second moon, mostly regarded as a “Wandering Star”, which imparts a twelve-year “super-tide” cycle. This is the actual cause of the 12-year super-tide (the Moontide), though only a few mage-scholars know of it. Through sheer good fortune, the Western continent develops a strain of magic – the “Gnosis” – which enables them to unify politically, religiously and militarily, tame nature and raise living standards, especially among the magi-elite. They learn how to build flying wind-ships (essentially airborne galleons) and 'discover' the eastern continent, not knowing the two continents were once linked. Using the gnosis one peaceable group of mages build a Bridge between the two continents to further trade, but instead war ensues… and our story begins. The Western continent of Yuros is inspired by mediaeval Europe, and the eastern continent of Antiopia by the Middle East and India. They all contain recognizable variants of certain peoples and religions from our own world, altered by the ‘twist’ that the presence of the gnosis brings. The gnosis is the second major difference to our world: I wanted it to encompass all of the skills that I felt a mage/wizard should have, but that no two magi would be alike: so I ended up with a system of ‘affinity’ to different branches of magic, that are essentially an expression of the personality of the mage. The magi themselves like to pretend their skills are “God-given”, to justify their social pre-eminence, though they are actually alchemical and biological 'gifts'. As for the characters, there is a fairly large cast, but the story-telling stays very close to a small group of POV ('point of view') characters, as I wanted the story to be both epic and intimate. The POVs come from different cultures but are generally united by their basic decency. None of them are inordinately powerful people either in status or magic, so they tend to be controlled by events, rather than shape their world, at least initially. • Alaron (“Westerner”): he’s a young quarter-blood mage-student about to set forth into adulthood. He’s very determined and has a strong moral-compass and inquisitive mind, but he’s also inclined to be impulsive and naïve, which gets him into a whole heap of trouble, especially when he stumbles into a conspiracy that threatens the Empire. • Elena (“Westerner”): she’s Alaron’s aunt, and a half-blood mage. Unlike her nephew, she’s an experienced campaigner, sick of her life of intrigues and betrayals. She’s beginning to rediscover her conscience – at what turns out to be exactly the right (or wrong) time. • Ramita (“Easterner”): she’s a lowly market girl whose family has an unusual hereditary trait. This leads to an unexpected marriage that utterly changes her life and loyalties and propels her into the heart of the coming conflict. • Kazim (“Easterner”): he’s the son of a refugee and Ramita’s fiancée, until their betrothal is broken in favor of someone else. Jilted, he falls under the sway of the clerics preaching holy war, and begins an odyssey to win back Ramita, in which a dark secret about his lineage is revealed. As you can see, they are a mix of people from both sides of the fence, and each comes with a supporting cast of friends and enemies. Each thread interrelates with the others as the story progresses, and combined their story tells the tale of the coming Moontide and Crusade. Q: World-building is one of the key ingredients of epic fantasy; your series is very strong on this factor. What is it about world-building that you love, and what are the keys to successfully crafting such a believable, yet fantastical world like that of the Moontide series? DH: My favorite fantasy books when I was growing up and discovering the genre were always the long immersive ones, where the fantasy world was filled with believable detail, and you could truly escape into another place. I really like to inhabit a story, and convincing world-building is crucial. I was the sort of reader who poured over the appendices of Lord of the Rings just as enthusiastically as reading the story. So when I approached the writing of Moontide, I wanted to create something with that sort of depth. I also wanted to give back some of what I’d seen and absorbed in our world, especially India which I'd fallen in love with. The world-building was helped by the studies I’ve done in history, classics and anthropology, and of course by travel. Also, I work in my ‘real life’ job with investments and money: that gets everywhere. Also, at the risk of sounding kinda geeky, I was a Dungeons & Dragons dungeon-master for about twenty years, and had to world-build like crazy. That’s pretty good training for a story-teller in creating new worlds, plausible backstories, juggling plots, and dealing with unpredictable character behaviour! Q: Themes of identity, ethnic diversity, racism & cultural disparities seem to play an important role throughout “Mage’s Blood”. How much of this did you draw from your own traveling experience? And how much of it was gleaned from history? DH: New Zealand is a former British colony, settled by Europeans after serious wars with an indigenous people, the Maori, whom the British never fully defeated. At one point the British army had more soldiers stationed in New Zealand than in any other foreign country. Ethnic identity and diversity are concepts that people here are familiar with, and we’re still working through who we are as a nation, as we deal with the legacy of colonial exploitation and reparation for it. So I didn’t have to travel to encounter such issues. Having said that, travel and what it shows of how other countries deal with such matters greatly widens your horizons and changes the internal debate. World history is pretty much a catalogue of culture clashes as we evolve to whatever it is we’re going to be. I love diversity, and believe strongly that people should be free to be different from other people, both within a society, and in the interactions with other societies. But diversity equals difference, and difference is what creates dividing lines and conflict. I think these things will always be in tension, and like high-wire walkers, we all have to navigate a balance between them. I believe that how a society deals with diversity and minorities to a large extent defines it. 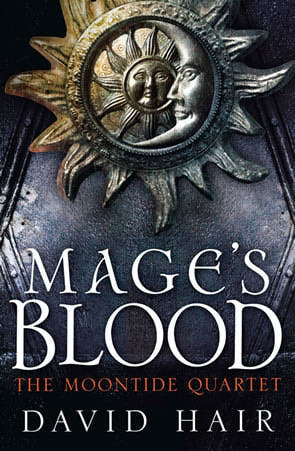 Q: Mage’s Blood is the first volume in a series. Could you give us a progress report on the next book, offer any details about the sequel “The Scarlet Tides”, and outline your plans for the series as a whole? DH: The Scarlet Tides is well-advanced, in that I'm onto my third draft, and I’m really pleased with it. It picks up all the threads and moves them around with a lot of pace and a few surprises. The first book of a series usually does the lion’s share of the world-building, allowing the writer to get right into the action in the later installments. Middle books are often the most fun. I have to submit The Scarlet Tides by the end of November and I’m well on target. The concluding two books after that are planned in some detail, but I like to allow myself some “wriggle-room” so that I can incorporate better ideas if I have them, so long as they fit the framework of the tale. I’ll start the actual writing of book 3 in quarter one of 2013. Moontide is a close-ended four book series, with no planned prequels/sequels or side-projects in that world planned as yet. Q: The Moontide series is your first book for adults and features a clash of civilizations storyline. Whilst you drew upon history to form the basis, you have added enough elements of your own to make it an enjoyable read. What was your precise motive in making this clash the major focus of the story and a literal one as it occurs between the two continents? DH: I suppose Moontide is a bit of a ‘post-9/11’ series, in that it’s written in the context of the conflicts and trauma the world is going through right now, from Gulf wars, holy wars, terrorism, financial crises and inequality. Every time we look at the news we see the clash of cultures playing out, and it’s the same old elements all the time: power, money, race and religion. My vision for Moontide is to reflect those factors and work with them. I want the characters in these books to encounter these issues and deal with them, to face people they have been raised to hate and fear and realize that they are human also (even if they still end up in conflict with them). They’ll have to make the big choices that reveal who they really are. Some of them will rise to the challenges they face, others won’t. There is the propensity for them to find redemption or not. Until I sit down to finish book four, I’m not actually sure which way some of them will go myself. Having said that, I do want to emphasize again that Moontide is not an allegory. The plot is driven by my idea of what makes a good scene or a dramatic encounter, not any ‘message’. Q: Who are your literary idols and which books are your favorites amongst the many genres that you read in? DH: My favourite YA book when I was growing up was The Weirdstone of Brisingamen by Alan Garner, which was the first book I read that integrated the modern with the mythic. I don’t know how many times I read it as a child. I then read Tolkien and became addicted to fantasy, and devoured whatever I could find, especially Stephen Donaldson and David Eddings. I also read some Sci-fi, mostly Frank Herbert, Isaac Asimov and Julian May. Outside the genre, Guns Germs & Steel by Jared Diamond changed my understanding of the world and is a brilliant book about how civilization has evolved. ‘Q’ by a collective of Italian writers writing as ‘Luther Blissett’ is a recent favourite set in the Hundred Years War, and I loved Cloud Atlas by David Mitchell – I can’t wait to see what they’ve done with the film version. Of recent fantasy, I’m a fan of Jim Butcher’s Dresden Files, and Joe Abercrombie’s (very bloodthirsty) books! I used to enjoy vampire stories, but the recent glut of teen romance vampire stories killed my enthusiasm for them. Q: You have previously written a YA series that focuses on the Indian epic of Ramayana and uses many crucial parts of it to power a contemporary story. How did the genesis of this series occur? DH: When I was in India, an American friend and I went off on a bit of a tour around Rajasthan. There is an amazing place there called Jodhpur, with a massive castle set on a rocky hill jutting from the desert, on the edge of the city. In the castle there is a gate where the handprints are preserved of the queens of a certain Raja. He had died, and they left their hand-prints in the stone before being cast onto his funeral pyre, in fulfillment of the ritual of sati. I was very moved by this, and the germ of a story, in which a young man is so infatuated with one of the queens that he rescues her from the pyre, was born. About a week later I met Mike Bryan at a party: Mike is English and was then the CEO of Penguin Books in India. It was early 2009 just before the release of The Bone Tiki, so we had writing in common, and got talking. Mike suggested merging my Jodhpur idea with something to do with the Ramayana. I took that idea away and worked on it, came up with a plan and some draft chapters and sent them in. Penguin India’s editors liked the idea and so the series was born. I had the time to write and they poured out very quickly: I wrote all four books in less than two years. Obviously it took a lot of research and travel to locations as well as talking to people about India and Indian culture – I could never have written such a series without the help of many people. And my editor at Penguin, Sudeshna Shome Ghosh, was wonderful. She completely understood what I was trying to do and did a fantastic job. The first book of the series, Pyre of Queens, even won an award this year here in New Zealand, from the NZ librarians association (LIANZA). DH: When I was a child I wanted to be a writer. I even remember filching a tiny notebook from my parents and starting to write a book (a fighter-pilot adventure very like Biggles): I got about two pages in, realized I knew too little and stopped. I was probably nine years old at the time. The dream never went left me, but it got trumped by other stuff: travel, career, marriage, kids, sport, divorce (that isn’t a cause-and-effect chain of events, by the way!). I didn’t finally start writing seriously until I was forty. So I feel like I’m making up for lost time. So, I’ve only just got here and it’s far too soon to think about legacies! All I can really say is that I’d like to follow through on what has been a promising start to this part of my life, and continue to improve. Mostly what I'd like is for readers who try out my books to afterwards say: "Yeah, that was good. Has he done any others?" NOTE: Author Picture courtesy of David Hair & URTE Map image courtesy of Jo Fletcher Books. Good interview! I enjoyed reading it. while Mihir was a bit modest listing me first interviewer as most of the questions were his, I really enjoyed the author's answers on my three questions (the two that contain the spoiler alert and the one in-between) which were essentially my main reservations about the book. This is a series to watch for sure.